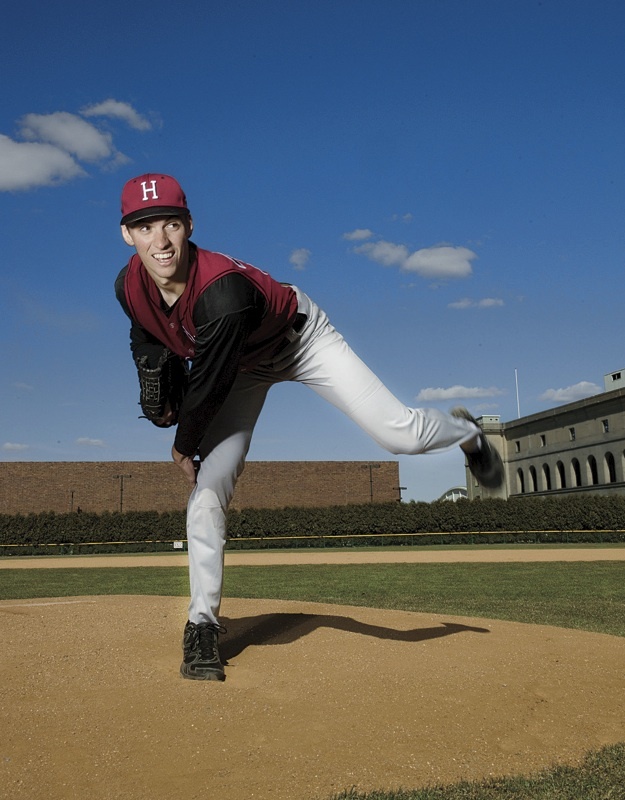 Harvard southpaw Brent Suter is one of the Ivy League’s elite starters. Watch a video of Brent Suter explaining and demonstrating his pitches. As a boy growing up in the Queen City, Brent Suter ’12 had an idol: the Cincinnati Reds’ Ken Griffey Jr., the speedy, power-hitting center fielder who retired last year after 22 seasons with 630 home runs, and who is a lock for the Hall of Fame. Like Griffey, Suter graduated from Archbishop Moeller High School, a parochial school that is a statewide athletic powerhouse. “I liked Junior’s [Griffey’s] swing, his ability to make plays in the outfield,” Suter says. “He seemed relaxed, just a really cool guy.” Suter’s Harvard uniform number is 24, the number Griffey wore when he played for the Seattle Mariners at the start of his career. Today, however, Suter looks to other role models: Randy Johnson, Andy Pettite, and Cliff Lee—all elite left-handed pitchers. A six-foot, five-inch, 215-pound southpaw, Suter has had considerable success retiring collegiate batsmen. In its preseason forecast, College Baseball Insider website named him the Ivy pitcher whom hitters least want to face and ranked him among the league’s top three starters. Last year, Suter was one of only two starting pitchers named to the all-Ivy First Team, and in one sparkling 33-inning stretch, he went a league-best 4-0 with one save and a 3.55 earned run average (ERA), while striking out 33 batters. Left-handed hitters were almost helpless against him, recording only two hits in 24 at-bats for an .083 batting average. Understandably, he still cherishes a dream he’s had since childhood: playing in the majors. There’s currently one Harvard-educated pitcher in the big leagues: right-handed reliever Frank Herrmann ’06, who had a creditable 2010 rookie year with the Cleveland Indians, posting a 4.03 ERA across 40 appearances. A generation ago, southpaw Jeff Musselman ’85 (see “The Dow of Professional Sports,” September-October 2001, page 39) pitched five seasons for the Blue Jays and Mets from 1986 to 1990. The Crimson has sent only five players to the majors since 1943, and only one Harvardian, infielder Eddie Grant, A.B. 1906, LL.B. 1909, played in a World Series, alongside Christy Mathewson and Jim Thorpe for the New York Giants in 1913 (see “Soldier, Scholar, Athlete,” November-December 1993, page 83). Actually, Suter throws two kinds of fastball, the two-seam and four-seam, differentiated by his grip on the ball (see “A Pitcher’s Grips.”) The four-seamer travels straighter and a couple of miles per hour faster: it’s a good pitch to try when a batter has two strikes, because the extra gas can blow the ball by a hitter for a strikeout. And Suter is a strikeout pitcher: last year he fanned 47 in 49.2 innings pitched, while posting a 4-2 record with a 5.26 ERA. As a freshman he whiffed 53 in as many innings. Nonetheless, the ability “to throw off-speed pitches for strikes is a big separator,” Suter says. Any baseball hurler worth his salt can pound the strike zone with fastballs, but if that’s his only pitch, hitters will begin to “sit on” (expect) the fastball and tee off on it. Hence the importance of off-speed pitches like Suter’s curve and change-up, which move differently from the fastball and arrive at the plate at a different speed. His “out pitch” is his change-up: thrown with the same motion as the fastball, but with a grip that nestles the ball in the palm of the hand, the change-up may travel eight to 12 mph slower than the fastball, fooling the batter into swinging ahead of the pitch.